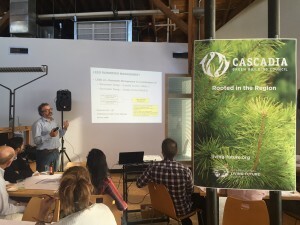 Twenty architects, planners, property managers, engineers, and green building professionals gathered June 15 to explore green infrastructure’s potential benefits for meeting the City of Seattle’s 700 Million Gallon goal within the Seattle 2030 District . Herrera’s Chris Webb helped lead discussion on applicability of GSI in different contexts, the new LEED v4 Rainwater Management Credit, and understanding the diverse co-benefits such as aesthetics and urban habitat creation. Participants had an opportunity to put concepts into action, as they engaged in an interactive experience “The Stormwater Game.” The game – developed by Herrera, and based on the Seattle 2030 District Water Calculator – challenges participants with scenarios in which to balance costs/benefits for ecology, water, habitat and aesthetics while applying stormwater strategies for low, medium and high density sites. The event was an event of the Seattle Collaborative of The International Living Future Institute. The mission of the Collaborative is to promote and embrace strategies that help create an ecologically restorative, socially just and culturally rich built environment in Seattle.